Giant seashell sculpture is a Growing Home! – Cool San Diego Sights! Giant seashell sculpture is a Growing Home! 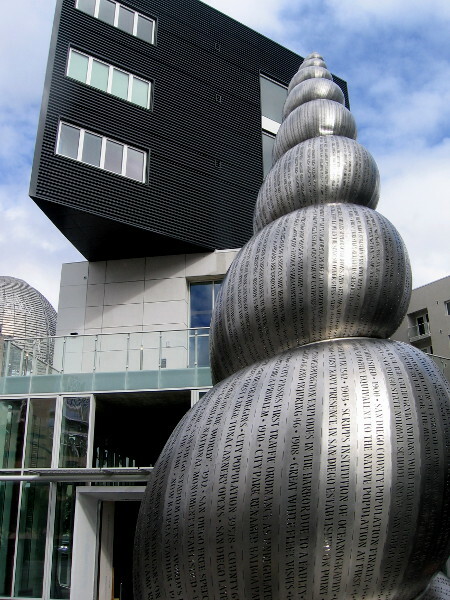 A child of San Diego sits in an enormous sculpture of a living seashell, a Growing Home. Some amazing public art was installed in East Village about a week ago! 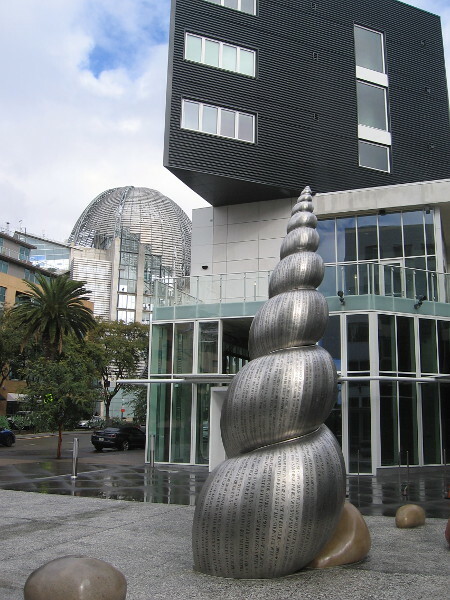 Growing Home is an enormous stainless steel sculpture of a sea snail’s living shell. 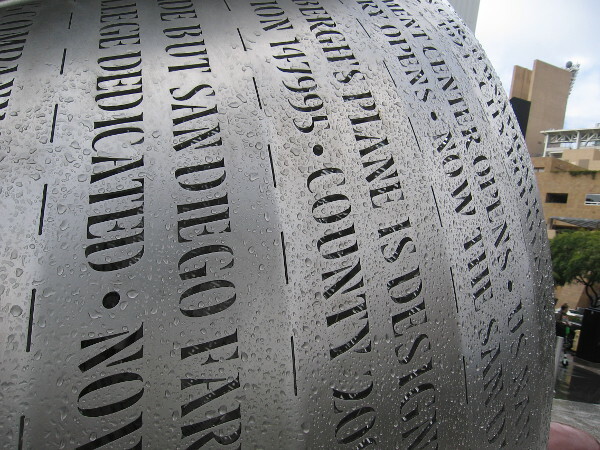 Laser-cut into the upward coiling shell are notable events from San Diego’s history. 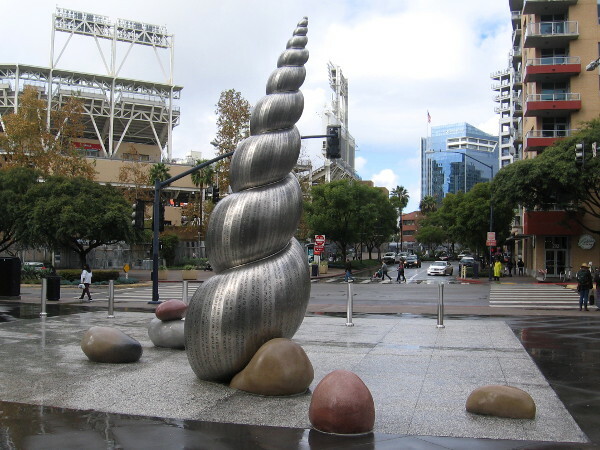 The sculpture can be found on the east side of Park Boulevard near Petco Park and the downtown Central Library. It stands at the new Park 12 – The Collection luxury apartments. Growing Home was created by Joe O’Connell and Creative Machines and is made of stainless steel with LED lighting. 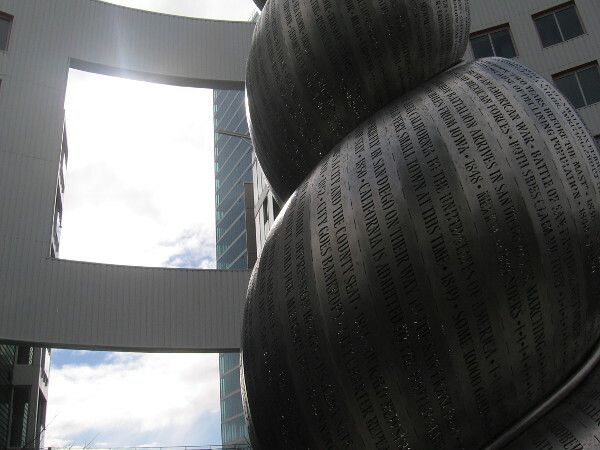 Creative Machines produces interactive and monumental art for clients around the world. They are based in Tucson, Arizona. 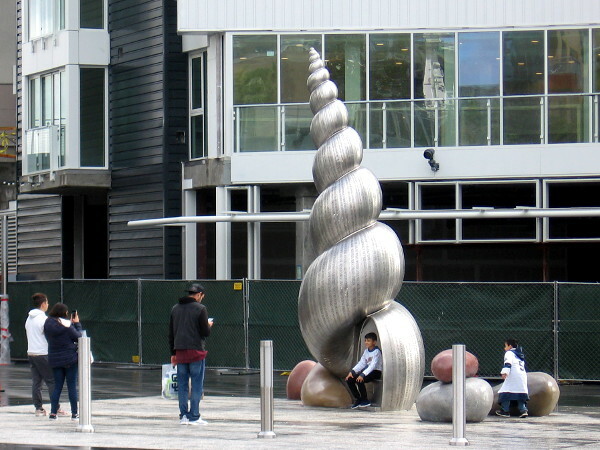 The shell represents the ever-growing city in which we live. 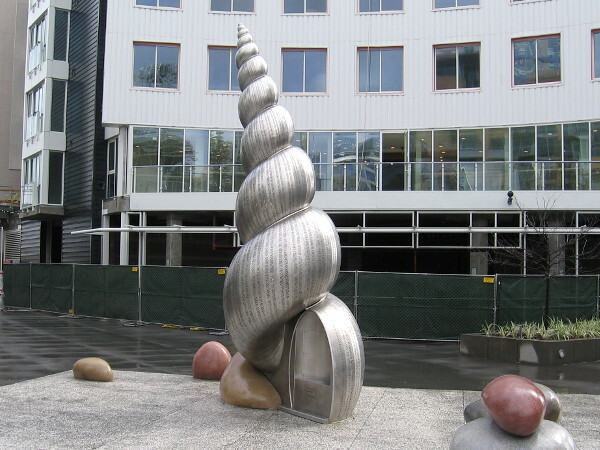 As history has progressed, the shell has grown and grown. I took these photos after a rain shower, so the large wet stones arranged next to the seashell seem to lie glistening on a beach! Growing Home rises as public art at Park 12 – The Collection, new luxury apartments in San Diego’s East Village. 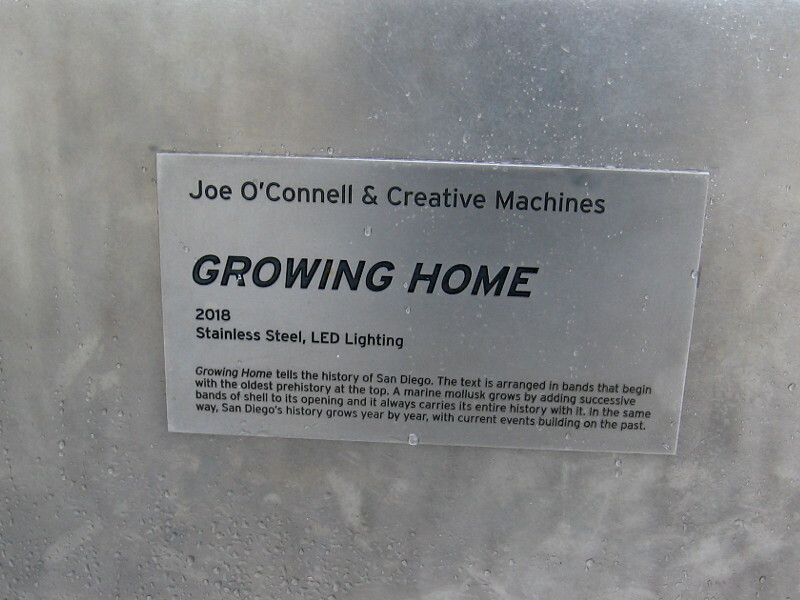 Growing Home, 2018, Joe O’Connell and Creative Machines, stainless steel and LED lighting. 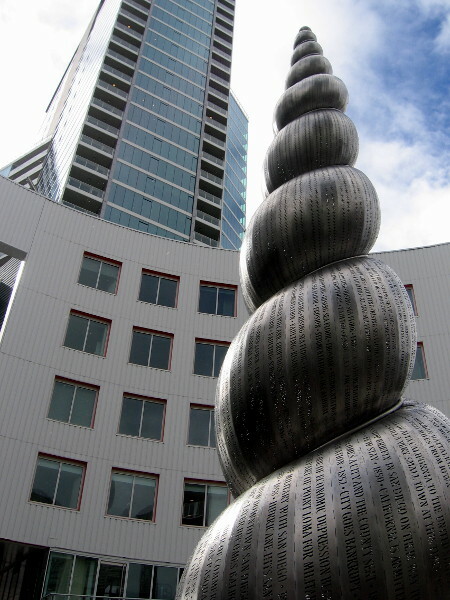 A city’s history grows like the shell of a marine mollusk. History becomes an essential part of an ever-growing city–a city that is home to many. 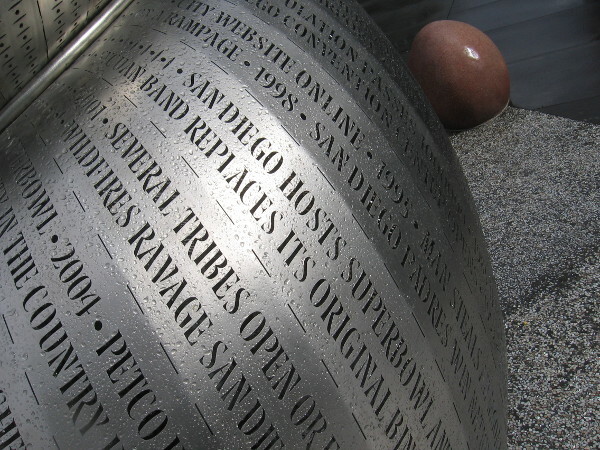 Growing Home features headlines of events that have shaped San Diego history. The lattice dome of the San Diego Central Library rises beyond Park Boulevard. Moments in history are preserved as words written in the growing shell. San Diego history become part of our lives. The city is our home. The coiled, elongated shell of a sea snail. Sit inside on a small bench for a fun photo! Growing Home rises at Park 12 – The Collection, in San Diego’s East Village. Previous Previous post: Petco’s “San Diego Section” honors local teams! Next Next post: Inspiring street art in Golden Hill.